In 2009, the newly established Dallas Center for Architecture was featured in Architectural Record. The article, by former TA editor Stephen Sharpe, Hon. AIA, discussed the challenge of attracting people to the space. The solution was a faceted glass wall facing the storefront and lit by an “enigmatic sequence of intense colored light.” The center was located north of downtown, and one of its aims was to command the attention of motorists driving by on the adjacent highway. When it opened, Dallas was in the midst of a recession and downtown development was focused on the Arts District, a 19-block district of starchitect-designed buildings. Woodall Rodgers Freeway divided the new center from downtown, but plans for an urban park (Klyde Warren) spanning the freeway were in the works. The center was banking on the new park to bridge the gap to downtown and draw the public off the street. Fast forward nearly 10 years: Klyde Warren Park has become a major destination, drawing nearly one million visitors in its first year. Development in downtown is booming, and the downtown core finally crossed the magic 10,000-resident threshold. 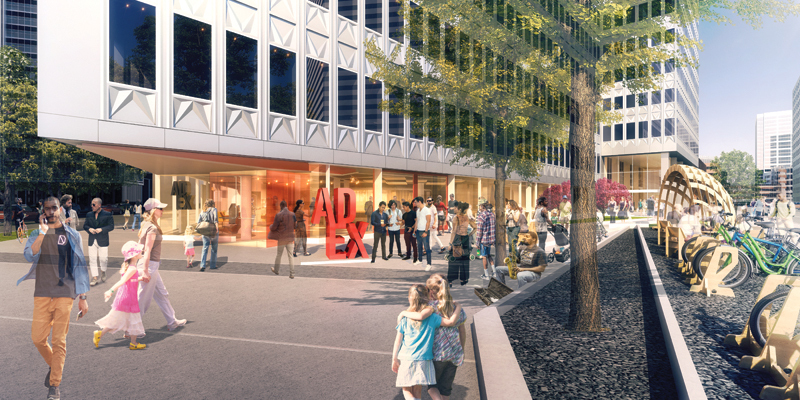 In June of this year, a press release announced that the DCFA would be moving downtown to Republic Center and changing its name to the AD EX, the Architecture and Design Exchange. 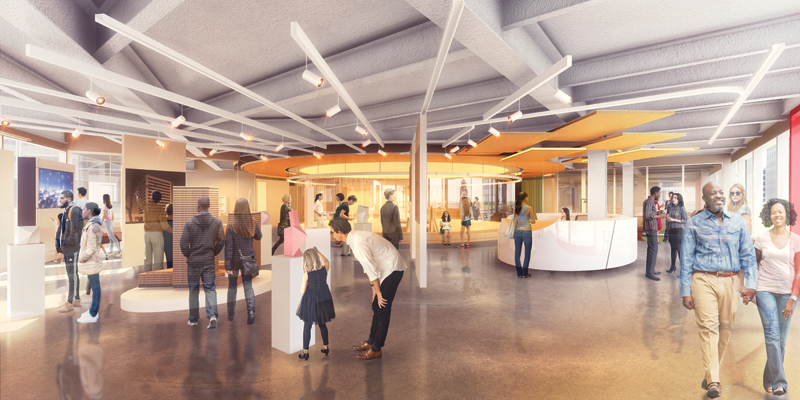 The new facility will still house the foundation and AIA Dallas, along with other allied partners. Version 2.0 — as it has been dubbed internally — shares many of the same goals as its predecessor. It aims to better engage the public and expand member services, relying on its new location to boost those efforts. The press release lauds the location in Dallas’ “dense” urban core, its street presence, and its proximity to a new park. Omniplan, the design architect, warned against the aspirational “build it and they will come” mentality, encouraging leadership to rely on quality programming. To support their multifaceted approach, they brought along a lengthy list of team members: lauckgroup (now operating as Perkins+Will) (interiors); Aurora (creative arts consultant); Better Block (activation consultant); RSM Design (branding); LDWW (rebranding); Studio Outside (landscape); and LUM Architectural Lighting Design and Telios (MEP engineering). James R. Thompson is serving as general contractor of the Phase One interior finish-out. The as-yet-unfunded Phase Two will address desired improvements to the outdoor terrace, and street engagement. As for the rebrand, AIA Dallas President Mike Arbour, AIA, and Architecture and Design Foundation President Emily Henry say it was a matter of relevancy. The previous name was stodgy and stiff. AD EX (pronounced as two words) was deemed hipper and more accessible to younger members, whose numbers have been declining in recent years. Whether the younger generation will appreciate the change remains to be seen, but texting their BFF will definitely be simplified by the acronym: SCNR. CU @ AD EX. AD EX will open its doors to members and the public in October 2018. Audrey Maxwell, AIA, is a partner at Malone Maxwell Borson Architects in Dallas.